The Newfoundland historically functioned as a working dog hauling in fishing nets and carting fish into town. The breed has great physical strength and a natural ability for lifesaving, especially in the water. The Newfoundland Club of America (NCA) has designed a series of exercises to develop and demonstrate the natural abilities of the Newfoundland dog. These exercises are in the form of an NCA Water Test and an NCA Draft Test. In both tests the emphasis is on teamwork between the dog and the handler and the dog’s willingness to work. The Newfoundland Club of New England (NCNE) promotes the natural abilities of the Newfoundland dog by hosting both water and draft tests each year. 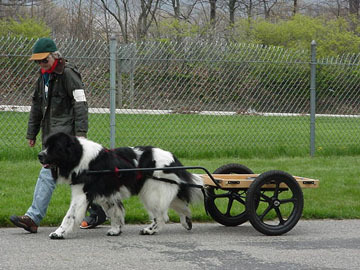 The NCNE encourages members to combine their Newf’s natural ability with training to help them perform the exercises in these tests. NCNE holds occasional seminars and clinics to help teach members how to work with their Newfs in obedience, water, draft, tracking, freestyle, agility and other events that encourage people to work with their Newfs as companions as well as in competition. Some of the events offered are “just for fun,” a time when people and Newfs can get together to enjoy each other’s company such as hikes, parades, and picnics. For a link to the NCA Working Dog web page, Click Here. To get a copy of the NCA Water Test Regulations, Click Here. To get a copy of the NCA Draft Test Regulations, Click Here.